XtreamInternet leased 840 SF of industrial space at 2280 Manatt Ct Suite B2 for 3 years. Anthony Damico of NavPoint Real Estate Group represented the landlord. This lease was executed in November. Benham Law Inc leased 250 SF of office space at 509 Wilcox Suite 103 for 1 year. 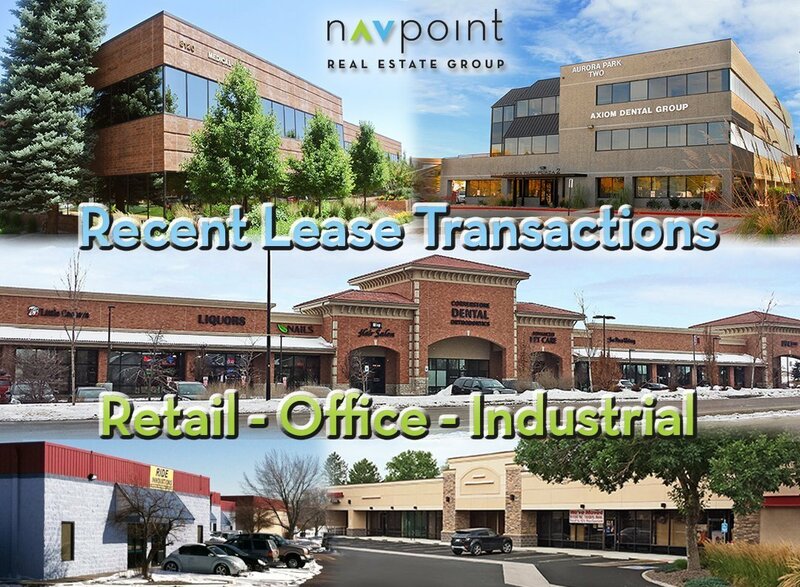 Anthony Damico of NavPoint Real Estate Group represented the tenant. This lease was executed in November. Sprint leased 2,400 SF of retail space at 5305 E Colfax Ave Suite A for 1 year. Ian Elfner of NavPoint Real Estate Group represented the tenant. This lease was executed in December. The Joint Chiropractic leased 1,200 SF of retail space at 1519 Park Central Dr Suite 200 for 10 years. Ian Elfner of NavPoint Real Estate Group represented the tenant. This lease was executed in December. Sprint leased 1,385 SF of retail space at The Corners at Wheat Ridge/38th & Wadsworth for 5 years. Ian Elfner of NavPoint Real Estate Group represented the tenant. This lease was executed in October.